Plus All-New Not-To-Be-Missed Bonus Material! BURBANK, CA (June 12, 2015) – The fourth season of one of television’s most intriguing programs, Person of Interest, is set for release on Blu-rayTM and DVD by Warner Bros. Home Entertainment (WBHE) on August 11, 2015. The season is also currently available for download in Digital HD. Person of Interest: The Complete Fourth Season will feature all 22 episodes from season four, plus two new featurettes, a gag reel, deleted scenes and much more. 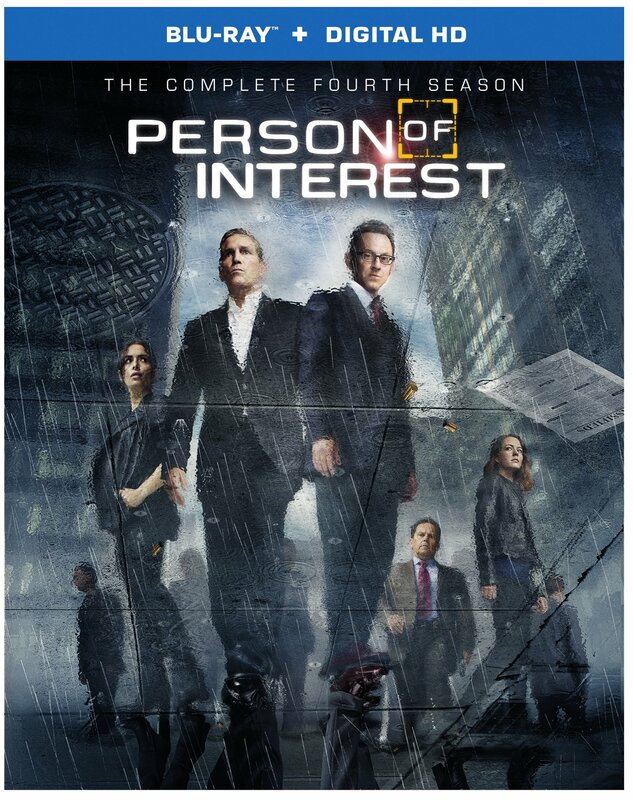 Person of Interest: The Complete Fourth Season will be sold on Blu-ray with UltraVioletTM Digital HD, which retails for $54.97 SRP and on standard DVD, which retails for $49.99 SRP. Order due date for both formats is July 7, 2015. With a second machine – Samaritan – now online, the members of the elusive team – Reese (Jim Caviezel) and Finch (Michael Emerson), along with lethal operative Shaw (Sarah Shahi), unpredictable cyber-hacker Root (Amy Acker) and homicide detective Fusco (Kevin Chapman) – are now targets themselves, hiding in plain sight. Facing unknown danger, the POI team must find a way to outsmart Samaritan, an all-seeing, all-powerful artificial intelligence that’s self-governing, continually evolving and growing stronger every day. Meanwhile, former enemy Elias (Enrico Colantoni) now becomes a desperate ally in the fight against a new gang known as The Brotherhood. Entering its fifth season on CBS, Person of Interest was created by Jonathan Nolan (The Dark Knight trilogy) and executive-produced by J.J. Abrams (Fringe, Lost), Nolan, Greg Plageman (Chase, NYPD Blue) and Bryan Burk (Fringe, Lost). Person of Interest is produced by Bonanza Productions Inc., in association with Bad Robot Productions and Warner Bros. Television. Music of Interest – Step inside the studio of Composer Ramin Djawadi for an intimate look at his process along with Show-Runners Jonathan Nolan and Greg Plageman as they discuss scoring sequences and key elements of music themes in Person of Interest. Going Underground with Root and Finch – Michael Emerson and Amy Acker give us a one on one tour through the newly created Subway Headquarters with the Production Designer, Rick Butler. Person of Interest 2014 Comic-Con Panel – Executive Producers Jonathan Nolan (The Dark Knight) and Greg Plageman (Cold Case) are joined by the series’ stars for a special Q&A at the 2014 San Diego Comic-Con. Digital HD with UltraViolet allows fans to watch a digital version of their movie or TV show anywhere, on their favorite devices. Digital HD with UltraViolet is included with the purchase of specially marked Blu-ray discs. Digital HD with UltraViolet allows consumers to instantly stream and download movies and TV shows to TVs, computers, tablets and smartphones through UltraViolet retail services like CinemaNow, Flixster, VUDU and more. For more information about UV, go to http://uvvu.com/faq. Consult an UltraViolet Retailer for details and requirements and for a list of HD-compatible devices. *Source: Nielsen Galaxy Explorer Live+7, 09/24/13-3/25/14. Posted in News, Press Releases, Warner Bros.Tagged Amy Acker, Jim Cavieziel, Michael Emerson, Person of Interest, Sarah Shahi, Season 4, The Machine, Warner Bros.